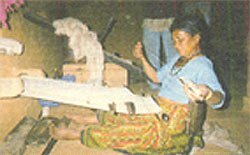 The Patua artists and storytellers were the precursors of cinema and television in Bengal. 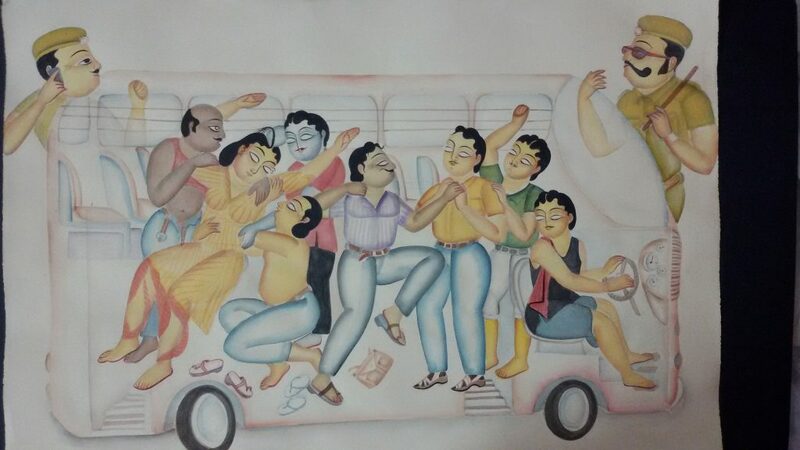 Wandering from place to place with their painted linear Pattachitra scrolls they regaled their audiences with stories, slowly un-scrolling theirpats. Stories of gods and goddesses, myths, folklore and legends provided entertainment, the Patuas communicating and interpreting the stories while in addition carrying tales of faraway events and momentous occurrences to their audiences. 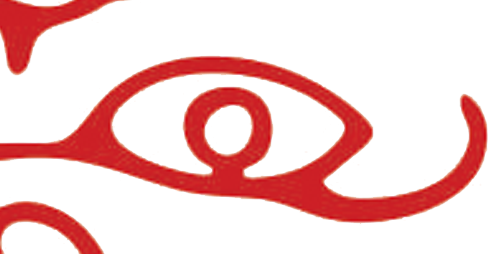 In the early years of the 19th century looking for new opportunities some members of the Patua community settled in the vicinity of the Kalighat temple in southern Calcutta. Then as now this most renowned of all Hindu religious sites in Bengal was a great marketplace for traders, artists and craftsperson’s selling votive objects and mementos for the pilgrims to take home as souvenirs. In this urbanized milieu of Calcutta the Patuas had branched out from the confines of mythological and religious pats to reflect on the increasingly Anglicized Bengali society. 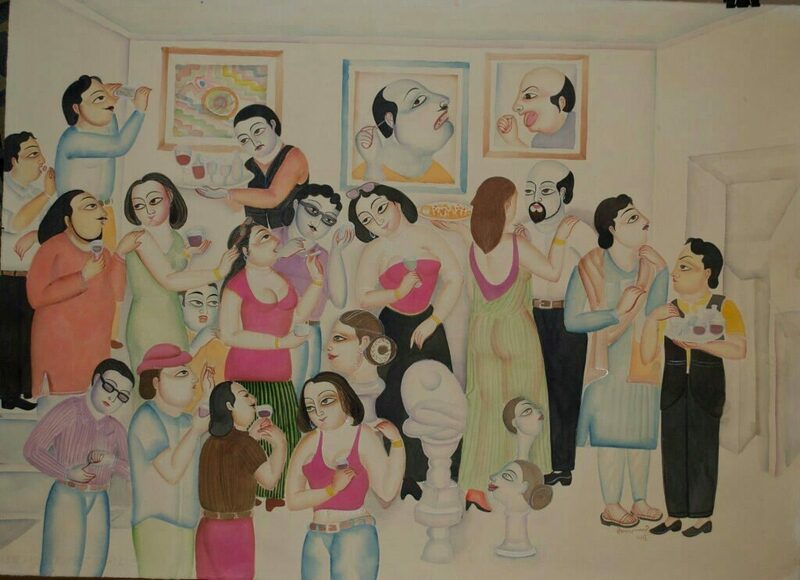 Depicting contemporary social themes, events, and lampoons that reflected the mores of a rapidly growing metropolis their subject matter now include the strains and fissures of changing times the artists presenting their view point caricaturing the modern Bengali gentlemen and their ladies with wry and sardonic humor. 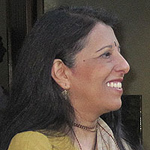 Current events, topical goings-on were also portrayed; none more famously than the sensational 1873 legal case that was branded the Tarakeshwar Affair. With all the ingredients of a potboiler the Patuas’ skills of caricature, imagination and newsworthiness were put to test as through their art they vividly imagined the extra-marital affair and subsequent murderous beheading that was the highlight of the case. The Patuas illustrations fed an avid audience who were agog to gather all the news on the case. This newsworthiness combined with their ability to capture the moment with a satirical twist expanded their audience beyond the traditional demands of the pilgrims to that of a larger public that included collectors and European visitors. This art style came to be termed as Kalighat painting, based on the eponymous temple in whose precincts the Patuas worked. 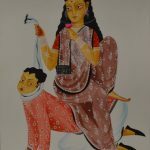 Pats in the Kalighat style of painting were the first works to be applauded, written about and recognized as the truly urban art of Calcutta by scholars with collections in private hands and in museums across the world bearingtestimony to the fame and appreciation of this art form. 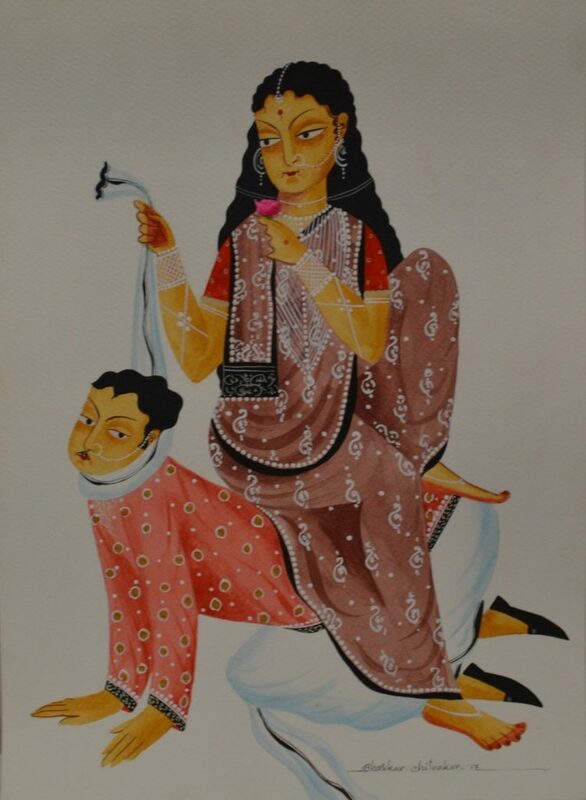 While the narrative arts of the Pattachitra and its poetic rendering of stories continued in Bengal the Kalighat style was to remain dormant for over half a century till the late 1990s when KalamPatuawho belonged to a traditional Patua family experimented with the form having seen his first Kalighat painting at Gurusaday Museum on one of his rare visits to Kolkatta.Working for years to perfect his form he hasn’t looked back since with his work in collections in prestigious museum in India and overseas, solo exhibitions and participation in international art workshops. 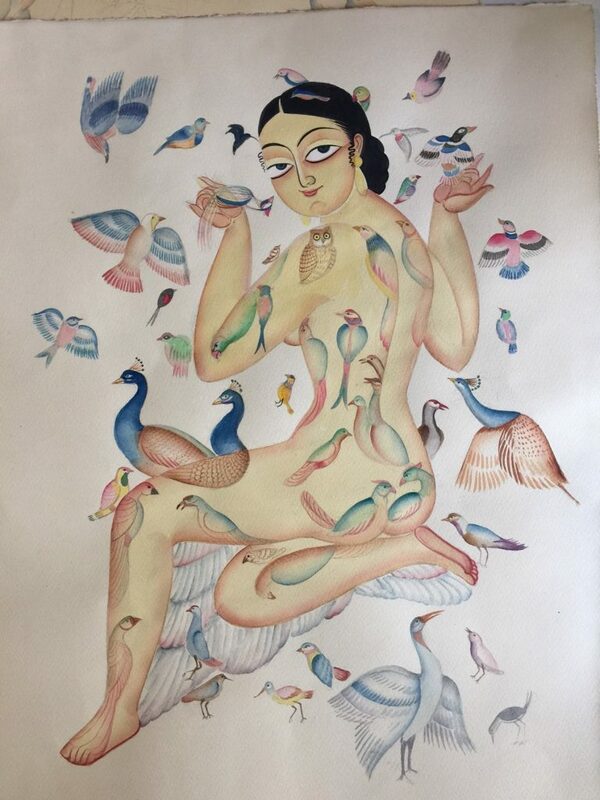 His efforts have seen a revival of the genre in Bengal with new Kalighat style artists emerging from traditional Patua families. 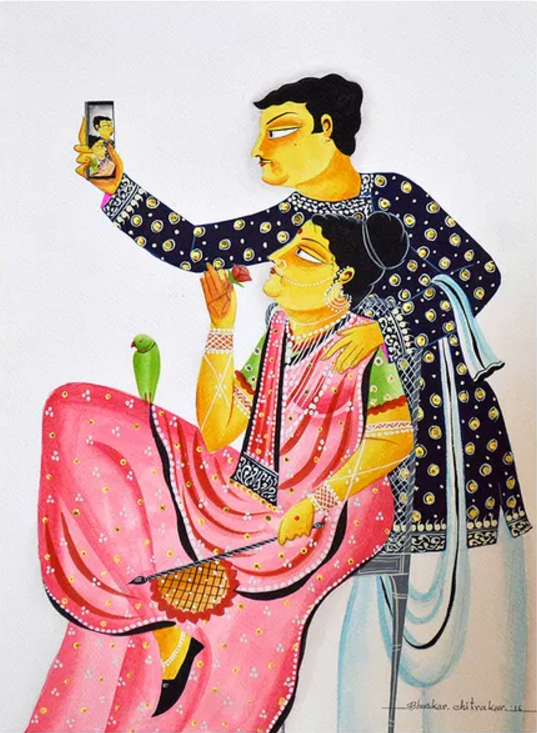 However his work and that of 30 year old BhaskerChitrakar stand out as their sardonic humorand witty paintings of contemporary India best represent the satirical approach of the Kalighat’s of the past. First published in Sunday Herald.